Wyatt Cheng "Dude with Skillz"
Wyatt Cheng is a Senior Technical Designer for Diablo III and one of the main creative forces behind class and skill design. He was the principal designer for Demon Hunter and Witch Doctor classes. Shortly before release Wyatt's public visibility increased dramatically as he became one of the leading spokespeople for Diablo III's development, design, and patch changes. For instance, he was the author of the hotly-anticipated patch v1.0.3 preview article. Wyatt comes to the Diablo III team from within Blizzard Entertainment where he previously worked on World of WarCraft: The Burning Crusade. Prior to joining Blizzard he worked on the action flight sim Secret Weapons over Normandy with Totally Games Inc.
Before that he was with EA Canada and worked on football titles such as FIFA, '97; '98 and '99 and World Cup '98. Wyatt on the D3CE Behind the Scenes DVD. 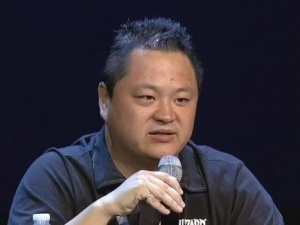 See all news items relating to Wyatt Cheng from Diablo.IncGamers.com. Wyatt Chengs Blog updates on the official Diablo 3 Site. This page was last edited on 9 November 2018, at 15:32.